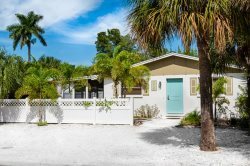 Swaying palms and a beautiful paver double drive lead the way to this Tropical Retreat on Anna Maria Island, Located just one block from Tampa Bay and 3 short blocks to the beautiful white sand Gulf Beach. This three-bedroom, two-bathroom home features volume ceilings, crown moldings, and open concept for ease of living and entertaining. Any home chef will be thrilled with the spacious kitchen, ample wood cabinetry, stainless appliances and a floating island with seating. Master suite features a King size bed, balcony and large master bath with soaking tub and separate shower. The guest room featuring twin beds also has a private balcony. The additional guest room features a Queen bed. The extra bathroom includes a shower and also features a separate Laundry/Wash room. Additional sleeping provided by a sleeper sofa in the living room. The spacious living and dining rooms open to an expansive covered deck surrounded by well-manicured tropical foliage, just below a luxurious, one of a kind Private Pool. This backyard offers peaceful privacy and a nice outdoor living space great for entertaining. Conveniently located close to the bay or Pine Avenue for boutique shopping and delicious local eateries. Pools & Spas: The rental property owner or rental property association controls pool temperatures. Not all pools are heated. Fran Maxon Real Estate is not responsible for pool or spa temperatures, closures or malfunctions. No credit, discount and/or rate adjustment can be granted for items mentioned above or circumstances beyond our control. There will be days when the weather conditions will not allow pool heaters to accommodate swimming and temperature recovery times will vary. Fees may be charged to the tenant to heat private pools. Please inquire when booking. Per the City Noise Ordinance: Quiet hours are to be observed between the hours of 10 pm to 8 am daily. This includes noise at the pool area. RATES, TERMS & CONDITIONS SUBJECT TO CHANGE WITHOUT NOTICE. RECEIPT OF INITIAL PAYMENT FROM GUEST TO FRAN MAXON REAL ESTATE INC CONSTITUTES ACCEPTANCE OF ALL TERMS AND CONDITIONS SET FORTH BELOW. JANUARY, FEBRUARY and MARCH may be subject to a 3 month minimum. Please inquire. * Holidays- Holiday weeks may be Subject to up to a 20% surcharge. * Ask about our special rates for 6 months or longer. Check-In: Check-in time is 3:00 PM. We cannot guarantee check in at 3pm during holidays and peak seasons. Your patience will be appreciated in these instances. If you arrive after normal business hours, your rental keys will be in an envelope with your name on it located in the pick up basket to the left of our office front door. For security purposes, we do not include the property address in the arrival envelopes, so bring your contract with you, which contains the property address and phone number of your rental. Keys will not be dispersed until final payment has been made. Please take care of the keys provided to you. $40.00 lock-out fee applies for any after hours emergency calls. Rate adjustments cannot be made for late check-in. Check-Out: Check-out time is no later than 10:00 AM on scheduled day of departure. Keys must be returned to Fran Maxon Real Estate upon check-out. A $25.00 charge will be assessed for any keys not returned to our office and will also be assessed for any lost keys. Rate adjustments cannot be made for early departure. Reservations: May be made during business hours. A rental deposit of 10% of the rental amount or $500.00, whichever is greater, is required in advance to confirm the reservation. (This amount will be deducted from the total rental amount.) Reservation deposits not received within five (5) days will cause your reservation to be void and removed from the books without notice from our office. Each reservation requires a $35.00 non-refundable reservation fee. Rental Payments: Rentals of one (1) month or longer, require the balance due to be paid 60 days prior to arrival. Weekly rentals require the balance due to be paid 30 days prior to arrival. Rental payments are payable by check, money order or cash. Credit Cards are accepted with an additional processing fee. Keys will NOT be dispersed unless required payment has been received. No refunds will be made due to inclement weather, no-shows or early departure. Taxes: All rentals of less than six (6) months are subject to Florida sales tax of 7%, (effective January 1, 2017), and a county tourist tax of 5% (effective June 1, 2009). This is in addition to the rental amount. CANCELLATION POLICY: In case of cancellation, a one hundred-twenty (120) day written notice is required for a refund of your reservation deposit and any pre-paid rent. If cancellation is less than one hundred-twenty (120) days prior to arrival date, no refund will be made unless unit is re-rented for the same period of time and at the same rate. A $100.00 cancellation fee is charged on refundable deposits. Travel Insurance: Travel Insurance is available by CSA Travel Protection. Travel insurance offers protection against loss of deposits and rent in case of unforseen illness, accident, jury duty or adverse weather that stops travel. Questions concerning CSA Travel Protection can be answered by calling 866-999-4018, or reviewing the certificate of insurance on their website at www.vacationrentalinsurance.com. To protect against loss of your rental deposit and payment, travel insurance is highly recommended. Some landlords may require a higher deposit if travel insurance is not purchased. Cleaning Fees: Will be charged in addition to the rent. Fees range from $100 to $300.Please confirm when booking. Excess cleaning charges will be charged to tenants. Damage Deposit Protection: Is mandatory and avoids the additional cost of a damage deposit. A fee of $39 will be added to all reservations. The Security Deposit Protection plan is designed to cover unintentional damages to the rental unit interior that occur during your stay. The policy will pay a maximum benefit of $1,500. Any damages that exceed $1,500 will be charged to the the tenant. If, during your stay at one of our Rental Properties, an Insured Person causes any damage to real or personal property of the unit as a result of inadvertent acts or omissions, the Insurer will reimburse the Insured for the cost of repair or replacement of such property up to a maximum benefit of $1,500. Certain terms and conditions apply. Full details of the Security Deposit Protection coverage are contained in the Certificate of Insurance or Insurance Policy. The Security Deposit Protection can be purchased up to, and including at, check-in. By submitting payment for this plan, you authorize and request CSA Travel Protection and Insurance Services to pay directly Fran Maxon Real Estate, Inc any amount payable under the terms and conditions of the Security Deposit Protection. Please see our link at the bottom of each page for a full description of coverage. Pets: Pets are not permitted in most rental properties unless specifically authorized in writing by the property owner. In the event that a property does accept pets a minimum of $150 non-refundable pet fee will be applied to the reservation. In the event a guest has a pet in a property where it is not allowed, this will cause forfeiture of all deposits and payments and the guest will be asked to vacate the rental property immediately. The guest will be charged for any costs with regard to returning the rental property to its original condition. Smoking: Smoking is prohibited in all rental properties. Please smoke outdoors and responsibly discard all smoking debris. If evidence is found of smoking in a unit this will cause forfeiture of all deposits and payments and the guest will be asked to vacate the rental property immediately. The guest will be charged for any costs with regard to returning the rental property to its original condition. Occupancy: Units are limited to the number of persons a property will sleep in beds and/or listed on the Reservation Agreement. Vehicles are limited to the number and type listed on the Reservation Agreement. No Parties allowed. If you have a party , overcrowd a unit or park unauthorized vehicles, you will be asked to leave with NO refund of rents or deposits. Boats, Trailers, wave-runners, RV's , etc. must be approved before allowing at the property. Maintenance: In the event of equipment malfunction at a rental property we will expedite repairs as quickly as possible. Any maintenance items should be reported as soon as possible and may require vendors to repair and/or replace equipment. Should a service technician find the equipment is not in working order due to guest misuse, oversight or neglect, the fee for the service will be charged to the guest. No rent adjustments can be made for circumstances beyond our control or for malfunction or loss of use of equipment or amenities. Amenities: Each of our properties is individually owned and reflects the tastes of the owners. We do our best to accurately describe each unit and its amenities prior to booking, but cannot be held responsible if guests are dissatisfied with the accommodations. If you have any questions about the property amenities, please call our office. We will gladly discuss them with you. The property will have the initial supply of bath soap and toilet paper. The Guest is responsible for any additional items during the stay. Items such as paper towels, laundry soap and cleaning supplies are the responsibility of the guest. Our properties do not provide beach chairs, beach towels or barbeque grills. Items Left In Unit: Neither the landlord nor Fran Maxon Real Estate, Inc will be held responsible for items left in the units. If you request us to retrieve and mail items left in the unit, you will be responsible for mailing/shipping charges plus a $25.00 processing fee. Telephones: are included in most units for your convenience. The Telephones have a block on long distance calls. You will need a calling card to place long distance calls. Utilities: Utilities are included in the rent in most cases. If any pre-determined utilities (examples: electric, phone, water, cable) will be charged to the tenant and additional utility deposit will be required. Pools & Spas: The rental property owner or rental property association controls pool temperatures. Not all pools are heated. Fran Maxon Real Estate is not responsible for pool or spa temperatures, closures or malfunctions. No credit, discount and/or rate adjustment can be granted for items mentioned above or circumstances beyond our control. There will be days when the weather conditions will not allow pool heaters to accommodate swimming and temperature recovery times will vary. Fees may be charged to the tenant to heat private pools. Please inquire when booking. Substitution of Accommodations: Where circumstances arise beyond our control (i.e., fire, hurricane, sale of unit, change in status of property, etc. ), your confirmed property may be unavailable upon your arrival. Fran Maxon Real Estate Inc reserves the right to substitute your accommodations. We cannot guarantee the confirmed rate in these instances. Although we will do everything possible to create a pleasant vacation experience, neither Fran Maxon Real Estate nor the property owner are liable for damages or inconvenience in this rare and unusual situation. If substitution cannot be provided the tenant will receive a full refund. Properties for Sale: In the event that the rental property is listed for sale, we may find the need to show the property during a guest’s stay. We will make every attempt to schedule the showing at a convenient time so as not to disturb your vacation. Mail & Faxes: Mail delivery to the homes is provided in Holmes Beach, Bradenton Beach and Bradenton. Home delivery is not provided in Anna Maria City. Tenants must arrange for a P.O. Box with the postmaster or have their mail sent “General Delivery”, Anna Maria, FL 34216. Facsimile services are available in our office with a cost $0.50 per page. Condominium/Homeowners Associations: Guests occupying a unit governed by an association shall abide by all association rules and regulations. Guest may be asked to complete an application and fee subject to approval by the association. Entry of Premises: Guest agrees to allow Fran Maxon Real Estate’s vendors, contractors or subcontractors access to the rental property for any reason to make repairs, improvements, care for or manage the property. Notice will be provided unless there is an emergency situation. Quiet use and enjoyment: Fran Maxon Real Estate does not guarantee quiet use or enjoyment of rental properties due to noise from other persons, neighboring properties, construction, maintenance, etc. Fran Maxon Real Estate cannot grant rate adjustments resulting from circumstances outside of the rental property. Indemnity: Guest indemnifies Fran Maxon Real Estate Inc from and against any and all liability, loss damage and expense, including reasonable attorney fees and disbursements arising from injury to persons or damage to rental property; occasioned by the failure of the property owner to comply with any provision of law or this agreement; occasioned by any act or omission of the property owner or any person residing in or renting owner’s property; occasioned by any act of omission of the property owner, or property owner’s agents, servants, or contractors; or, occasioned by any act of omission, with the exception of such acts or commissions constituting gross negligence or willful misconduct of Fran Maxon Real Estate, its agents, servants, or contractors when acting as agent for the property owner as provided herein. Special risks may be involved when using pool and/or spas/hot tubs and guest assumes all responsibility for himself/herself and their guests and for the consequences of those at risk. Guest agrees to waive any claim whatsoever and hold harmless Fran Maxon Real Estate and the property owner for accidents and claims resulting from accidents and or injury arising from use of the rental property and any of its equipment, porches, decks, stairs, parking area, elevators, etc. Agency Disclosure: Pursuant to Florida Statutes Chapter 475, you are hereby notified that in connection with the property rented by this firm, Fran Maxon Real Estate, Inc is agent for the Owner and is being compensated as such by the Owner. Tenant acknowledges that this written notice was given, and is understood, prior to signing Rental Agreement, in compliance with all applicable Florida Statutes.